Server to Server tracking is becoming increasingly important as more Do Not Track regulations are enforced, specifically around the usage of cookies. Server to Server, or Server Postback tracking, uses a unique identifier for each click that is stored on your tracking engines server. This unique identifier contains any/all information that would normally be stored in a cookie, so when the user converts, the identifier is returned to the server and correlates the correct click to the conversion. Tracking202 uses the tag [[subid]] to generate this unique identifier. As an Affiliate using Tracking202, you can structure your campaigns to pass the unique identifier [[subid]] through to HasOffers tracking links. The actual value for [[subid]] is generated by Tracking202's servers upon redirect, and is a unique value on each click which should be passed into the HasOffers tracking link. As you are pulling your Affiliate link from a HasOffers network, you will want to add the [[subid]] as an "&aff_sub=[[subid]]" value in your tracking link. This way, HasOffers can pass that value back on conversion, and Tracking202 will recognize the value and register a conversion. When setting up your Campaign in Tracking202, you are asked to place your Affiliate URL. You will want to copy and paste the tracking link exactly as it is displayed above. 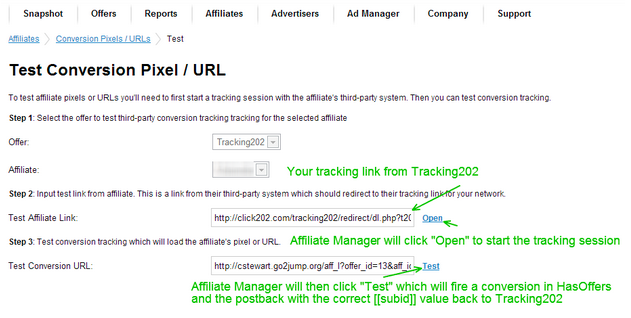 Once you have saved your Campaign in Tracking202, navigate to the "Get Postback/Pixel" section of the Tracking202 setup. 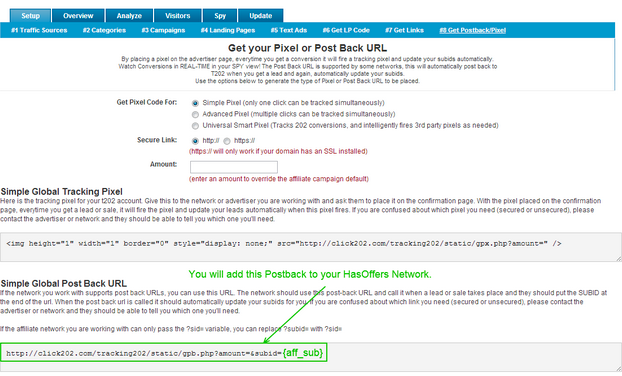 You can load the postback from Tracking202 on the Offer page within HasOffers. You will want to make sure and select "Postback URL" as the Type, and insert the appropriate tags as displayed below. You can also pass the postback to your Affiliate Manager, and have them place your postback for "All Offers". If you go this route, make sure that you have followed the tracking link instructions each time you setup a new Campaign in Tracking202. You will not need to add a postback on each campaign in HasOffers. HasOffers is updating the functionality Affiliates will be able to place a Global Postback from their interface soon! To Test that the values are passing correctly, you should have your Affiliate Manager use the Test functionality within their dashboard. 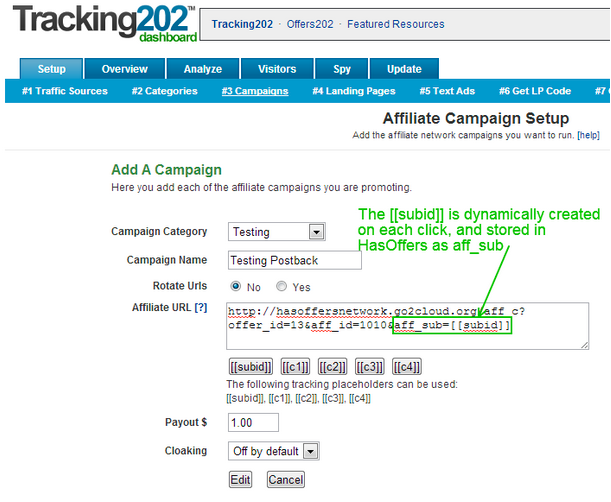 Your Affiliate manager will need your Tracking202 link that you will use in production, so the correct [[subid]] values are passed from Tracking202 to HasOffers. It is PERTINANT that they have your tracking link from Tracking202 to perform this test. As VP of Global Sales, Cameron actively contributes to business development strategies while working directly with our global client base. Since joining HasOffers, he has combined his business development and leadership experience with customer centric views to deliver an experience that revolutionizes customer care standards in this industry.